The first plesiosaur skeletons were found in England by Mary Anning, in the early 1800s, and were amongst the first fossil vertebrates to be described by science. Many have been found, some of them virtually complete, and new discoveries are made frequently. One of the finest specimens was found in 2002 on the coast of Somerset (UK) by someone fishing from the shore. This specimen, called the Collard specimen after its finder, will be on display in Taunton museum in 2007. Another, less complete skeleton was found in 2002, in the cliffs at Filey, Yorkshire, England, by an amateur palaeontologist. The preserved skeleton will be displayed at Scarborough's new Rotunda Museum, from 2007. Many museums all over the world contain plesiosaur specimens. Notable among them is the collection of plesiosaurs in the Natural History Museum, London, which are on display in the marine reptiles gallery. Several historically important specimens can be found there, including the partial skeleton from Nottinghamshire reported by Stukely in 1719 which is the earliest written record of any marine reptile. Others specimens include those purchased from Thomas Hawkins in the early 19th century. Historic specimens such as these are on display in several museums in the UK, including New Walk Museum, Leicester, The Yorkshire Museum, The Sedgwick Museum in Cambridge, Manchester Museum, Warwick Museum, Bristol Museum and the Dorset Museum. A historic specimen which has recently been prepared as part of a scientific study was put on display in Lincoln Museum in 2005. Peterborough Museum holds an excellent collection of plesiosaur material from the Oxford Clay brick pits in the surrounding area, most of which has been collected relatively recently. 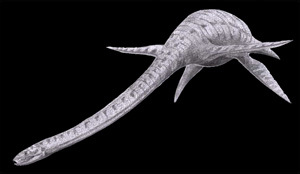 The most complete known specimen of the long-necked plesiosaur Cryptoclidus, excavated in the 1980s can be seen there.